← Who Are You? Angel or Bolter? This was too cute to not share. A friend of mine is in the hospital recovering from bone surgery and it was posted on her page. 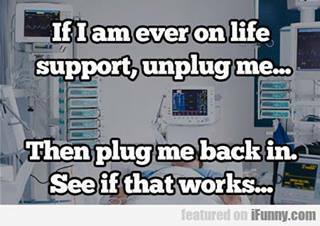 We are all in Information Technology and there is an old standbye procedure of if it doesn’t work just unplug and try again. I laughed till I thought I would choke up! Have a great Monday folks!!!!!!!!!! !